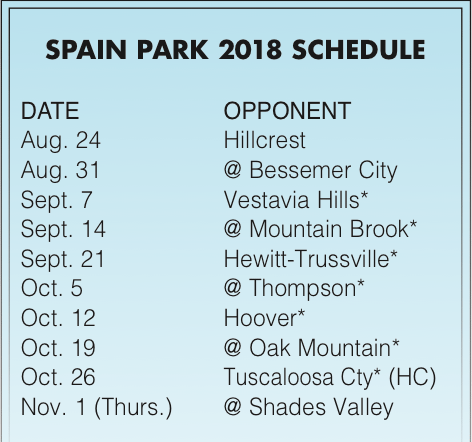 Members of the 2018 Spain Park High School varsity football team include: Jaylen Ward, Cedric Tooson, Jalen Henderson, Trever Bernier, David Moultry, Manny Austin, Jacob Jenkins, Johnathan Williams, Mason Pronk, Josh Cheatham, Chris Mancill, Brodi Susce, Demillion Simms, Harrison Barker, Braxton Hall, Patrick Davis, Micheal Neal, Michael Ogletree, Josh Wallace, Kenyon Hines, Joshua Stanton, Dolan Wilson, Neal Partin, Colton Ledbetter, George Hill, Kam Beckham, Ben Rice, Kameron McDaniel, Zach Rushing, Kishawn Dawsey, Richard Moses, Paul Wiggins, Khaleb Simmons, Braxton Harrelson, Marcellus Payne, Zachary Graham, Keon Handley, Jariun Mott, Braden Brock, Scott Moates, Steven Pate, Josh Burks, Jackson Major, Logan Edwards, Alex Morton, Micah Moore, Sam Moates, Dre Robinson, Gage Hughes, Creel Richardson, Ben Hill, Rodney Scott, Jaquaylon Gipson, William Mote, Jack Guthrie, Jayst Dorion, Zac Shaw, Ethan Prolsdorfer, Ben Franks, William Harper, Goodwin Tidwell, Chaz Bounds, Austin Pronk, Colton Punzel, Baylor Black, Joseph Heatherly, Josh Mullins, Zach Smith, Stephen Olsen, Zach McPeters, Cameron Young, William Vinson, James Broderick, Michael Callens, Cooper Kelley, Larry Ford, Jake Horton, Layth Abusuad, Drake Tabor, DeQarius Hill, Kendarius Cunningham, Jay Tibbs, Ashanti Carter, Clifford Robinson and Tai Smith. Journal photo by Ingrid Schnader. 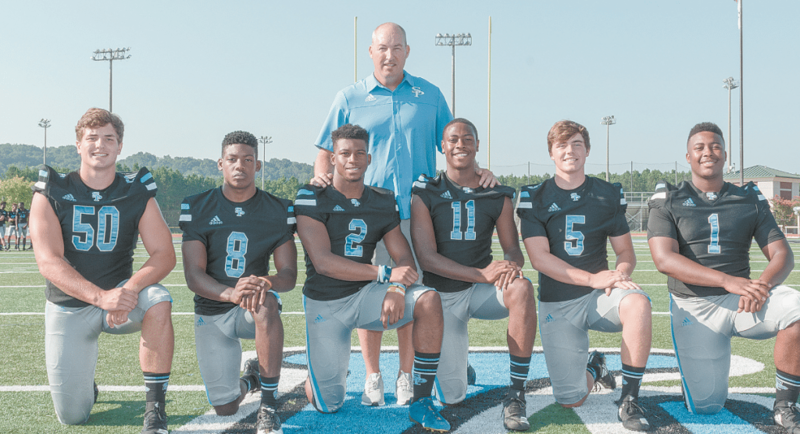 Spain Park will have some key positions to fill in 2018, but coach Shawn Raney feels confident that he has enough “program kids” who are up to the task. “Program kids” are what he affectionately calls the athletes who have been a part of his program from the moment they could be but who often are inexperienced and undersized before their arrival, who work hard and patiently wait on their turn to play on Friday nights. Raney said he’s pleased with the way his players have been preparing for the season during spring and fall practice. “We’ve had some kids come along defensively and I think we’ll be more athletic,” he said. The Jaguars fell in the first round of the state playoffs a year ago, a 33-21 loss at Hewitt-Trussville. 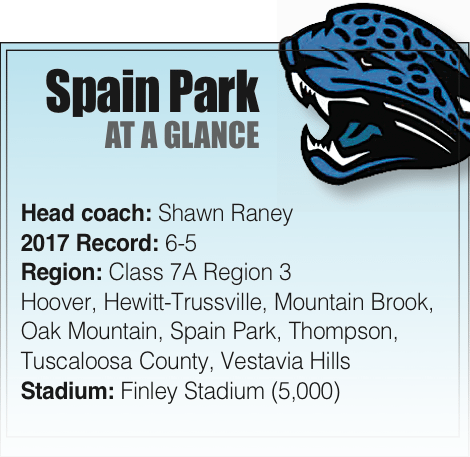 Raney decided then that, if the Jaguars were going to improve while playing in Alabama’s toughest region of high school football, they needed to begin on defense. Braxton Hall has played cornerback for the Jaguars for the past two seasons, and while he’ll continue to see some time at his old position, he’ll also play some at outside linebacker. Kenyon Hines will continue to take some snaps at wide receiver, but he’ll also split some time at the same outside linebacker position. Colton Ledbetter moves from linebacker to safety. Dre Robinson and Josh Wallace will also bring experience at linebacker. Jaguar leaders with head coach Shawn Raney, from left: William Mote, Jake Carver, Jalen Henderson, Kenyon Hines, Mason Pronk and Cedric Tooson. The front four has holes to fill, but with Cedric Tooson and Jake Horton on the ends, the Jaguars have some experience and size. Horton added 15 to 20 pounds to his 6-foot-1-inch frame in the offseason. The rest of the defensive line will be by committee, led by Scott Moates and DQue Hill. On offense, the Jaguars look to fill the shoes of quarterback Braxton Barker and running back D’Arie Johnson, who graduated last year. Mason Pronk, a junior, will get the first opportunity at quarterback. Johnson split carries with Jalen Henderson last season, and Henderson will return to carry the larger share of the load in 2018. He put on 5 to 10 pounds of muscle in the offseason, and Raney is confident that he’ll have a breakout season. While he had just 10 fewer carries than Johnson a year ago, Henderson figures to take about 70 percent of the carries this season. He’ll be spelled by Manny Austin. Along with Hines, Kameron McDaniel will see the majority of the time at wide receiver, while George Hill, Ben Rice and Jacob Jenkins will rotate in. Three-year starter William Mote will move out from center to tackle and Josh Mullins will move in to center, while Cameron Young, Jack Guthrie and Zac Shaw will fill in the rest of the offensive line. The Jaguars will have a chance to accomplish that first goal Aug. 24 when they host Hillcrest, of Tuscaloosa. 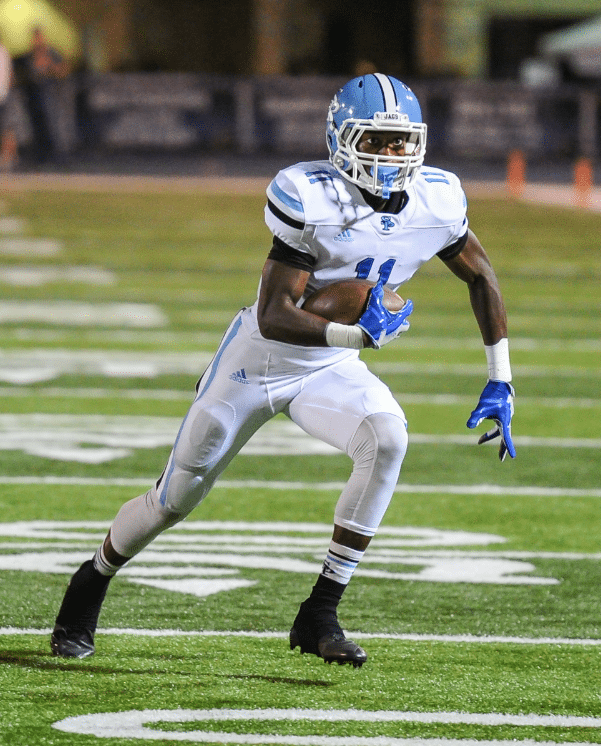 They’ll hop into the 7A Region 3 competition Sept. 7, when they host Vestavia Hills.